I have spent much of the last nine months on a publishing project for the Association of Professional Futurists (APF), where I am a Board member, to mark the organisation’s 10th anniversary. 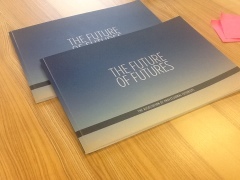 The book,The Future of Futures, mostly designed to be distributed as an e-book but also published in a short print run, was launched yesterday at the World Futures Society’s conference in Toronto. Obviously it’s an honour to be asked to edit such a thing, and the eventual ebook is a monograph running to around 50 pages, with contributions from around a dozen APF members. A book such as this needs some kind of organising principle, and – given the anniversary element – we hit upon a “past, present, future” theme. The APF is blessed with some distinguished members, and so the book boasts, for example, essays by Wendy Schultz on the history of futures, by Richard Slaughter on integral futures, by Riel Miller on futures as a discipline, and by Noah Raford on design futures and experiential futures. There are also pieces on the future of Africa and the notion of “the temporary city”, a radical take on urbanisation by Cindy Frewen Wuellner that deserves to become influential. I contributed an investigation of how the 2×2 “double uncertainty” scenarios model had become so influential, and what this told us about the history, and future, of scenarios practice. One element of the book that I’m particularly proud of is the “genealogical map” of the history of futures, on which I worked with Wendy Schultz. The map is based on the APF’s Prezi on this subject, and was brought to life with a bit of wit by the book’s designer, Jason Forrest. Anyway, it is clear from such an exercise that futures practice and theory is at something of a junction; methods which have served it well for its first half a century are starting to run out of road. As editor, it fell to me to write an afterword that pulled together some of the implications for the next decade of futures work, and I have included this in full here. The notion of futures as a separate practice is now around 50-60 years old. In dating it in this way, I am placing the origins somewhere between Fred Polak’s book The Image of the Future, Gaston Berger’s founding of the Centre International de Prospective, and the creation of the Hudson Institute in 1961 by Herman Kahn as the first bespoke futures consultancy. Much of the futures practice we have now would be recognizable to these pioneers, in terms of methods, of practice, even of clients. We are starting to see some clues. Looking back at the contributions to this book, here is my assessment of the characteristics which will shape the future of futures. It will be more distributed and more networked, more at home with the social media tools which are starting to pervade other research practices, as Alex Pang observed in answering his own question. It is still early days: we know that networked futures can do some things well, other things less well. There will, though, be more data. Futures will find its own way to make the “complexity turn” (to use John Urry’s phrase) which has characterized the intellectual life of almost every discipline in the past 30 years. While the futures academy has already engaged with complex adaptive systems and emergence, these have been slower to inform futures methods. Futures will rediscover some of its roots in philosophy, building (or re-building) a knowledge base that places more emphasis on how we know what we say we know when we make claims for futures work. The epistemology and ontology of futures work will become increasingly visible. Different ways of knowing, exemplified by approaches which emphasize the importance of values and of experiential understanding, will become more evident in futures practice. Futures will become better informed about its history and its contexts – leading to practice based on a richer understanding of methods and their rationale. Futures was born into a world of growth, the emerging consumer economy, and the Cold War. It will grow up in an age of ‘descent’; futures that address a world of resource shortage or even collapse will no longer be regarded as dystopian. One implication is that we may see a resurgence in visioning as a part of futures practice. All practices have a context, and the contexts here go beyond those of an emerging discipline finding its feet. Futures practice has been fortunate, perhaps, to reach this stage in its evolution at a time when the North Atlantic financial crisis continues to spread such a large political and economic shadow, and when the politics of energy and resource scarcity are becoming rapidly more visible. Taken together, these represent an eighty-year crisis, and perhaps even a three-hundred year one. New ways of imagining the world are more urgent than ever. The challenges are huge: never was there a better time to test the implicit claim made by all futurists, that good futures work can make a difference. The evolution towards richer and deeper methods, which allow us to ‘disturb the present’ in more fundamental ways, could not come at a more necessary time. The Future of Futures e-book costs $10 and can be bought here. It is free to members of the Association of Professional Futurists. The photograph at the top of this post was taken by Andrew Curry and is published here under a Creative Commons Licence: some rights reserved.